The confluence between the Obama administration and the journalists who cover it can leave news consumers wondering if they're getting the truth, the whole truth, and nothing but the truth. Two prominent media personalities -- liberal Fox News Channel commentator Bob Beckel and media mogul Mort Zuckerman, owner of the New York Daily News -- have recently let slip that they have worked closely with the Obama administration. Neither disclose this fact with regularity. Indeed, their recent admissions were revelatory. Zuckerman, a self-described Obama supporter, has written at least one speech for the President. Beckel, who worked with David Axelrod during the campaign, is now an adviser in some capacity to the White House. When Beckel goes on Fox to bemoan "Republicans who are shooting their mouths off [and] have no idea what they're talking about," is he speaking as a political commentator, or as an adviser to, and consequently a representative of, the Obama White House? His recent admission has obscured that line. And when the New York Daily News's editorial board endorsed Elena Kagan's nomination for the Supreme Court, was it Mort Zuckerman the media mogul or Mort Zuckerman the speechwriter overseeing the endorsement? 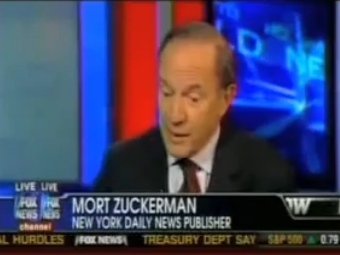 Granted, Zuckerman is more of a centrist than Beckel. $2.8 billion in assets is generally enough to turn one against liberals' business-bashing instincts. But despite Zuckerman's chiding of Obama for his anti-business policies and rhetoric, his work for the administration raises questions of journalistic objectivity. He at least has a responsibility to disclose the fact. This creates a very interesting ethical question about the role of the media in politics. Should the publisher of a newspaper and the editor of a magazine pinch-hit as speechwriters for political candidates? If Zuckerman actually did this, did it influence his coverage of the campaign, or at the very least, of the speech? As David Thompson notes in Ed Driscoll’s comments section, no one would blink if The New Republic’s owner Marty Peretz had done something like this, as TNR is an explicitly pro-liberal magazine with a point of view. Zuckerman owns and/or runs two publications with more pretense of objectivity, which makes this much more troublesome. It is worth mentioning that both of Obama's speechwriters have denied ever speaking to -- let along collaborating with -- Zuckerman on any of Obama's public addresses.